At Halloween time, many of us treat our minds, trick our memories and fill our hearts with the eerie, wild, fun and sometimes creepy spirit of the holiday and from spirits of the dead. The last five Halloweens have been filled with even more excitement for Drew Durham (that's me), Assistant Manager here at Reach And Teach because of the creation of the Books of Elsewhere, one of my all-time favorite series of books by master word artist/author Jacqueline West. I was blessed beyond all magic to have interviewed Jacqueline West recently and she graciously allowed us to post the interview here on our site and to promote it via social media. I hope you'll enjoy the interview, check out some of the books, and share this with your friends on Facebook, Twitter, and if you have any connections to the other realms, send it that way too! 1. How would you introduce yourself, your career and your mysterious series Elsewhere? What do you say about Elsewhere's illustrations and illustrator? Hello! I'm Jacqueline West, and I'm a writer of middle grade and young adult novels, short stories, and poetry-most of it fantasy of one stripe or another. My middle grade fantasy/mystery series The Books of Elsewhere has garnered a lot of nice awards and accolades, and has been published in eleven other languages so far. The illustrator of The Books of Elsewhere is the utterly brilliant Poly Bernatene, whose style perfectly captures the creepy but whimsical atmosphere of the stories. I'm so lucky to have had my work paired with his. 2. What do you think of Halloween? One of the books is set on Halloween how do you think spirit of Halloween plays out in the series? Oh, I adore Halloween. At Halloween-time, fantasy and mystery and horror filter into our everyday lives in ways we usually don't allow. (Most of us don't have skeletons and tombstones and little black bats proudly on display in our homes year-round...although-ahem-some of us do.) We get to put on costumes and masks and pretend to be more magical or monstrous than we ordinarily are. I tend to love-and to write-fantasy works that are set in the real world, but that have strange, impossible, magical things infiltrating those real-world settings...and I guess that's the spirit of Halloween in a nutshell! 3. 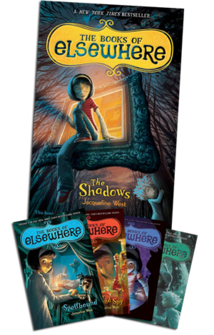 To some, Olive Dunwoody, the lead character in Elsewhere, is one of the most dynamic and relatable young girl protagonists in 21st century children's literature. You once said Olive arrived to you as one package, yet she develops so smoothly through each story. What was your process like for writing Olive? What discoveries did you have while writing Olive's stories? Olive Dunwoody did appear in my head quite fully formed: I knew her name, I understood her personality and emotions and fears and quirks, I could picture what she was wearing, right down to her scuffed tennis shoes. She felt real to me, like she was already a girl I could have met in an elementary school classroom, or walked past on the street. And I loved her for that realness. I didn't want Olive to turn out to be half-vampire, or have hidden magical powers, or discover that she's destined to fulfill some heroic quest. She's an ordinary girl who finds her way into some totally extraordinary circumstances. And for me, that's where the fun really begins. Sometimes Olive makes terrible mistakes. She's young, and she's impulsive, she's full of fears, she can be stubborn and secretive, and often she's too quick to trust people or to take chances-plus, she's up against some extremely powerful adult enemies. Sometimes she behaves in ways that I honestly dislike. But as a writer, when your characters start to do things that you didn't plan or expect or even really approve of, you know you're onto something! At those times, I had to let Olive act in a way that felt true to her. Because she's not perfect. She's human. When Olive saves the day-and sometimes she does that too!-it's also thanks to her real, human qualities: kindness, creativity, faith, loyalty, sympathy for others. 4. What's the story with Olive's parents? They seem totally awkward and rigid like a literary set of parental math textbooks. What are your observations about them? Ha! I actually have a huge soft spot for Alec and Alice Dunwoody. Olive's parents are both brilliant mathematicians, and they see the world in logical, mathematical terms. To them, math is exciting and romantic and magical. Because Olive is so different from her parents, she sees things that they simply don't see. Olive finds magic (literally!) in things like art and animals and mysterious old houses. I think Olive's parents genuinely care about her, and Olive genuinely cares about them...they just see the world through different lenses. And this actually makes all of their lives much richer. 5. 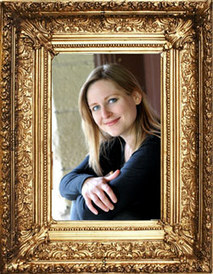 Tell us why you choose art and paintings to be the portals to Elsewhere? As a writer, describe your relationship to visual art. I'm a sucker for stories of all kinds. To me, paintings are like one frozen instant of a story. When I was little, I loved to imagine that paintings were just holding still as long as someone was looking at them, and that as soon as everyone left the room, they would come back to life: painted trees would rustle, painted water would slosh, painted animals would run or flutter, painted people would move and talk and fix their hair... Those frozen stories could continue. That childhood daydream is where a huge part of The Books of Elsewhere came from. 6. I understand that you wanted Olive to be a realistic kid. Clearly Olive's gifts and faults play pivotal roles in the books. What can Olive teach older readers? I'm not sure that Olive can teach older readers any specific lessons, but I hope she'll remind adults of what it feels like to be a kid-when your emotions are so deeply felt, but you don't have the tools to understand and cope with them, or when the real world doesn't seem to have a place for you in it, or when impossible things feel possible, because you haven't yet learned all of reality's rules. 7. What part of Olive's growth process do you think has the most impact on you as a writer? What does Olive have to teach all of today's readers? The way that the old stone house on Linden Street gradually becomes Olive's home-not just because of the house itself, but because of all the people that fill it-is the most impactful part of the story to me. When you love someone or something, and when you love it enough to even put it ahead of yourself, then you've found your home. 8. I've heard part of your personal magic is that you have great memory of your childhood. Is this true? How has this gift changed your writing? What would your child-self say to you today? Yes, I have a lot of exceedingly clear memories of my childhood. Or maybe I've never really grown up. Either way, I still feel pretty closely in touch with my childhood self. (A lot more in touch than I am with my adult self! I forget how old she is half the time.) I'm lucky in that I've got lots and lots and LOTS of material to mine for stories. This impacts my writing in more ways than I can even perceive, I'm sure. And what would my child self say to me? She'd probably be a little disappointed that I didn't become an archeologist/ballerina/veterinarian/Wonder Woman, as we originally planned...but I'm sure she'd be pleased with how things have turned out. Then she'd ask if she could read my books. I hope she'd like them. 9. What is the role of friendship in this altogether unforgettable series? Friendship, or the journey from loneliness to friendship, is really the core of the story. Olive starts out as a shy, awkward, isolated girl who gradually finds a place that feels like home. Books have often felt like home to me. Books have been there for me at the darkest and loneliest times of my life. I hope that Olive and the cats and the rest of the characters in The Books of Elsewhere can do the same for other readers-that they can be a place of escape and company and wonder and refuge for anybody who feels alone. 10. What do you want the legacy of the series to be? Any parting thoughts or advice? Any new take home messages? Any book discussion guide questions for the series? Legacy? Gosh. I just hope people will read the books. I'm delighted that they do. Books have saved me. They've built me. They've made my life what it is. To know that now my books are in the hands and imaginations of readers all over the world is such a privilege. So that's my take-home message: Thank you, readers! Thank you, thank you, thank you.